It’s really not Christmas until we make a cake shaped like a log, and prematurely plow through the chocolate treats in our Advent calendars. Well… consider it Christmas because here we have A LOG (that’s really just a cake made of whipped cream and cookies) (and the Advent calendar is loooong gone)! I made a Yule Log-type Cake a few years ago. It had a soft (gluten-free) chocolate cake filled and rolled with peppermint whipped cream and topped with chocolate ganache. So light and fluffy! Dreams, really. This year’s Yule Log Cake is beyond clever. 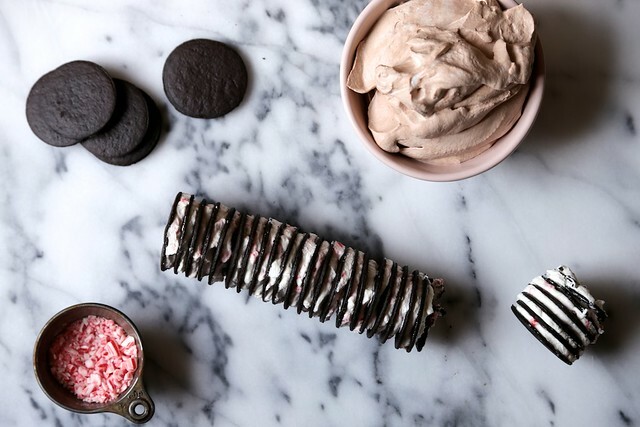 We’re stacking thin chocolate wafers with peppermint whipped cream and topping it with chocolate whipped cream. It’s an Icebox Cake! No-bake. Minimal fuss. Joy the Baker Icebox Yule Log Cake from Joy the Baker on Vimeo. Because the cake was such a cinch. We made you a Christmas video, too! We were feeling cheeky and we like to play with our food. Thank you to the creative mind of Hilton Carter and the reliability of the Canon 6D for this video. I’d like to pat myself on the back for making a giant stable mountain of ‘whipped cream’ out of meringue and foil. Take a look! This genius recipe is inspired by America’s Test Kitchen. Do you know the hardworking people at America’s Test Kitchen? 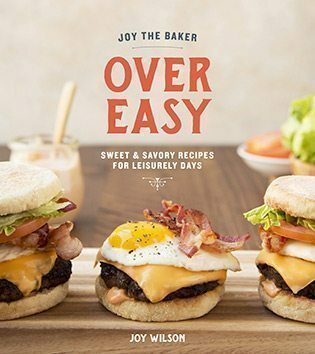 They’re a wonderful recourse for great recipes and amazingly sensible kitchen techniques. I love their cookbook The America’s Test Kitchen Cooking School Cookbook. Now let’s stack these cookies and call it a cake! It’s definitely as easy as it seems. Heavy cream is whipped until fluffy and crumbled candy canes are folded into the cream. It’s minty. Each cookie gets a good dollop of the peppermint cream, and then the cookies are stacked together juuust so. The whipped cream is soft but still solid enough to hold its shape as the long is stacked. It’s like Legos, but food. Once assembled, the cake-log is wrapped in plastic wrap and frozen until solid throughout, about 5 hours. While the cake freezes we whip up the chocolate whipped cream. Then we break off a piece of the cake-log… we’re making a branch people… it definitely makes sense. Now would be a most excellent time to place the cake-log on a serving platter. I chose to go marble all the way. 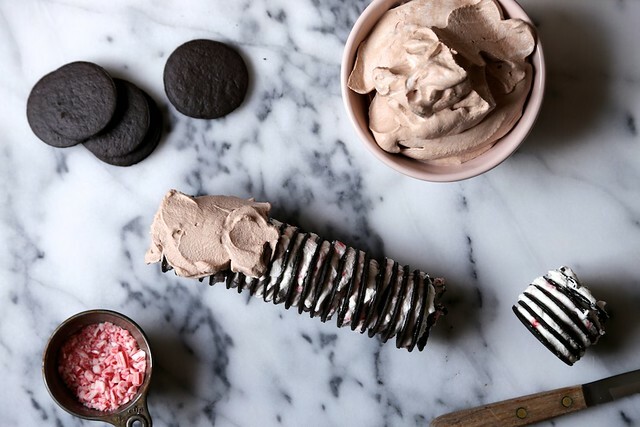 You might feel like you under-whipped your chocolate cream. It’s better to err on the side of under-whipped. It’s smooth and spreadable. Over-whipped cream doesn’t spread as smoothly. Once the log is frosted, on goes the cookie-branch! Use the tines of a fork to lightly draw wood grain into the whipped cream. Totally normal. Oh! Let’s talk about decorations too! Meringue marshmallows are a great idea. They’re pretty easy to make and there’s melted chocolate involved so… we really can’t go wrong. Peppermint-flavored. Chocolate-covered. Log-shaped. Festive cake. It’s Christmas, and we’ve got the green sprinkles, candy canes, and meringue marshmallows to prove it. 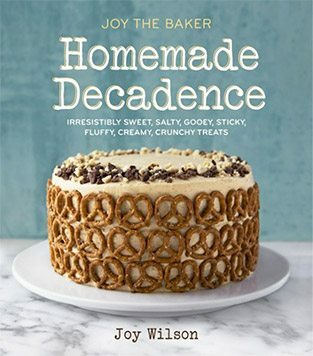 This cake is great made a day or two in advance and stored in the freezer until about 20 minutes before serving time. 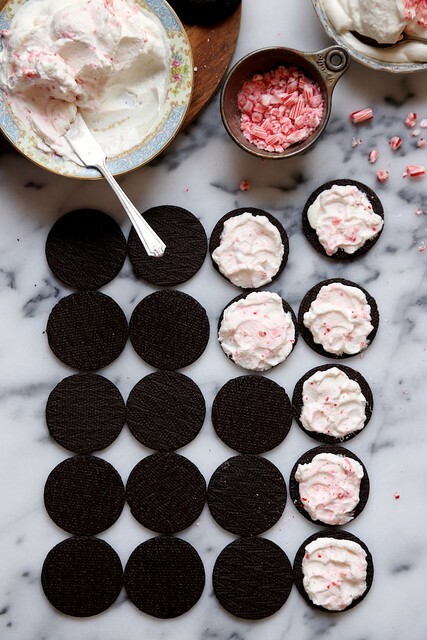 The cookies soften and meld perfectly with the peppermint whipped cream. It’s simple and sweet. I feel so accomplished, and so will you… and we didn’t even have to turn on the oven. Merry Christmas, friends! First make the peppermint cream. In the bowl of an electric stand mixer fitted with a whisk attachment, beat 1 cup of heavy cream with 1/4 cup powdered sugar, 1/2 teaspoon pure vanilla extract, and a few drops of peppermint extract. Beat to soft peaks. The whipped cream should hold its shape but still be pillowy smooth. Stir in the crushed peppermint candy and place the whipped cream in a medium bowl. Lay out 30 chocolate wafers. 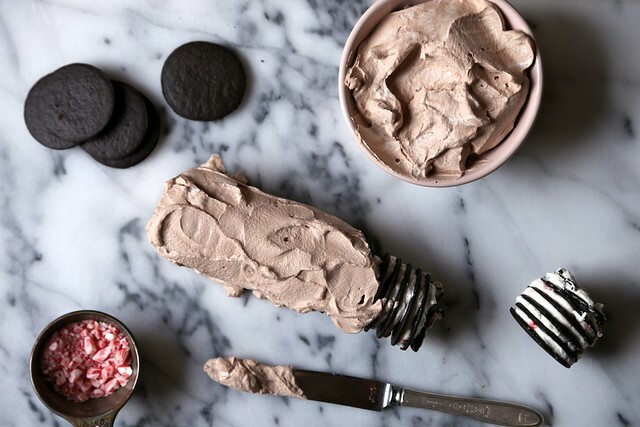 Spread 1 heaping tablespoon peppermint cream onto a chocolate wafer. Top with another wafer and repeat 4 more times to produce a stack of 6 wafers with cream in between each cookie. Make 5 stacks, each with 6 wafers. Spread 1 tablespoon peppermint cream on top of 5 stacks, leaving 1 stack plain. Lay cookie stacks on sides and press together end to end, making one log about 14-inches long Wrap log in plastic and freeze until firm, at least 5 hours or up to 1 week. The cookies will soften slightly as it freezes with the peppermint cream. 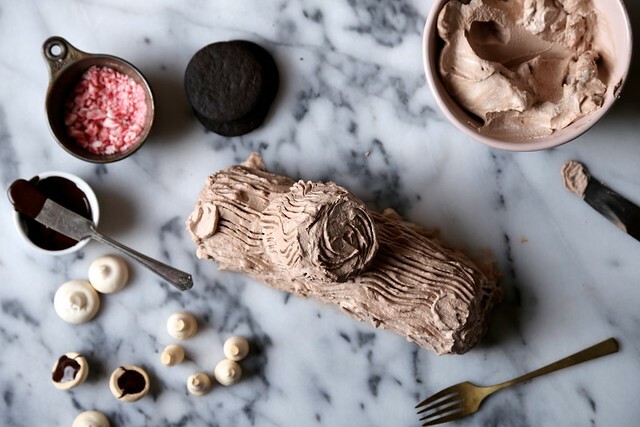 While the log freezes, make the chocolate whipped cream. In the bowl of an electric mixer fitted with the whisk attachment, beat remaining 1 cup cream, remaining ¼ cup powdered sugar, remaining 1/2 teaspoon pure vanilla extract, a few drops of peppermint extract, and cocoa powder until soft peaks form. The whipped cream should hold its shape but still be smooth when spread. Less is more. Cut 2-inch piece diagonally from other end of frozen log and set aside. Transfer frozen cake to serving platter. 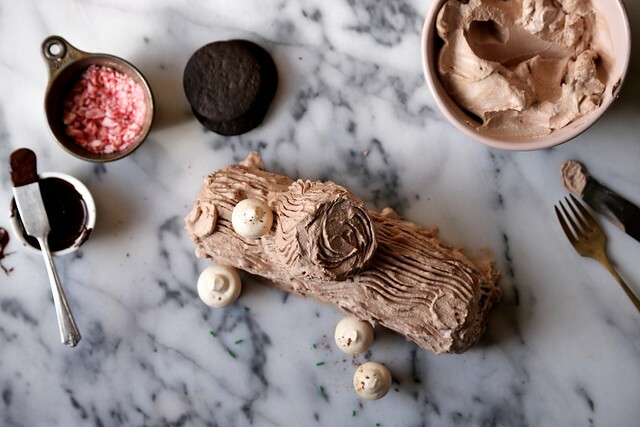 Spread the chocolate whipped cream over the cookie log. Press reserved 2-inch piece on top of log to make bump, placing it several inches from one end of log. Cover bump with cocoa cream. Drag tines of fork down length of log to simulate bark. Freeze until firm, at least 3 hours or up to 2 days. Before serving, let stand at room temperature for 20 minutes. Garnish platter with meringue mushrooms and, just before serving, dust generously with powdered sugar. Do I know the folks at America’s Test Kitchen? Actually, I do! My friend works there testing and comparing and all that good stuff. we always called this zebra cake! 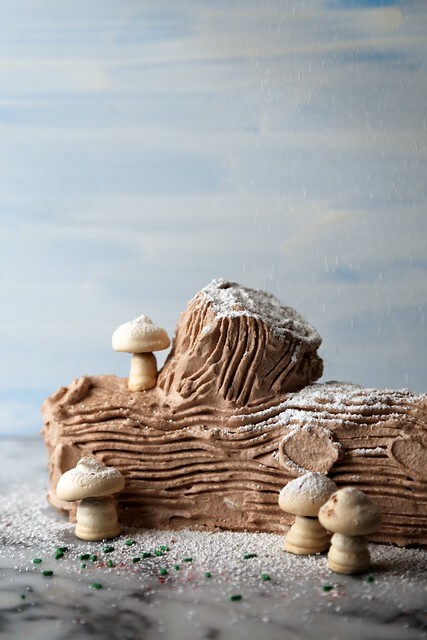 Love your buche de noel! 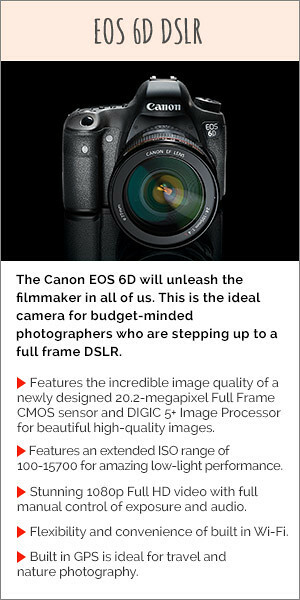 Love my canon 7d! How in the world did you make that video?! I want to dance with the cookies!! Joy it looks amazing! I can only imagine how GOOD it tastes! The flavors, the textures, and I love that it’s no bake. I recently dusted off my mom’s 1970s recipe for creme de menthe bars and it called for those Nabisco Famous Chocolate Wafers and I literally went to Albertson’s, Ralph’s, and Vons on a grocery store scavenger hunt for those things but finally found them :) Now I know where I can go so I can make your icebox cake! Love the video. One cannot help but smile. Great looking cake too. I could not ask for better Xmas themed dessert. i love the ice box cake yule; i saw a recipe for one of these and doubt it. However yours looks so professional and classy. The shots for this cake are mouth watering. Dang, girl! That cake looks so awesome! What a talent you have! Love it. Hi Joy! This cake looks so yummy!! Definitely an easy recipe to try for Christmas! After assembling the cookies and cream together to make the log shape, can you just put it in the fridge to set, or do you have to freeze it? 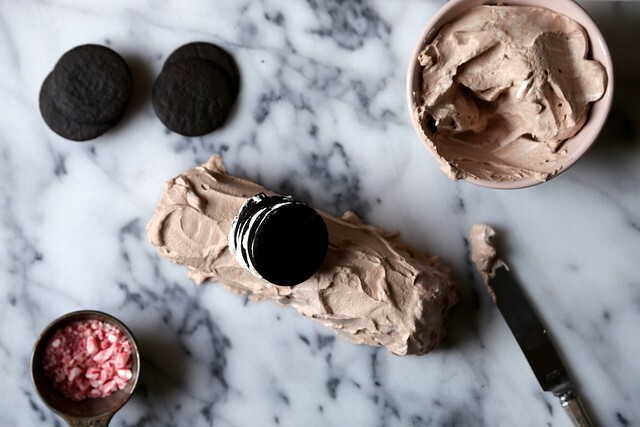 Is there a risk that the cookies and cream will remain frozen inside the icing, when serving? Joy, you really are genius! The video is so fun and this log is just beautiful and so creative. 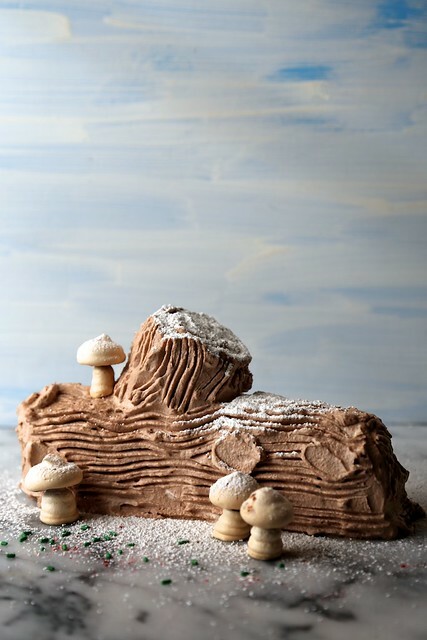 Everyone will wonder ‘why didn’t I think to make an icebox yule log!’ We’re not Joy the Baker, that’s why. And the pictures and styling are just beautiful. Happy Holidays! OMG! It’s perfect and I’m sure delicious too! Also the video is unbelievable! Great job! Gorgeous. I love the idea of cookies and cream as the base to a yule log – such a simple idea and it would work well with other flavours too. And gorgeous video, by the way – adorable.